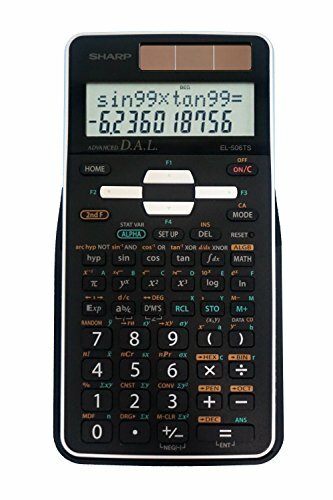 EL-506TSBBW is an advanced 2 line scientific calculator with Direct Algebraic Logic (D.A.L.) display, which allows calculations to be displayed as written on paper. Perfect for students studying higher level math and science including pre-algebra, algebra I & II, geometry, precalculus, calculus, trigonometry, statistics, biology, chemistry, and physics. This model features a glossy black finish with white accents. The home key allows users to start fresh from any screen. The EL-506TSBBW has eight temporary memories, four formula memories, one independent memory, and one last answer memory. This calculator also allows equation editing & playback, 1, 2 & 3 variable statistics, normal & stat modes, six regression types, and N-BASE calculations: HEX, BIN, DEC, OCT, PEN. Other functions include: logarithms, reciprocals, powers, roots, factorials, normal probability, trigs, and hyperbolic trigs. Includes a 3D light reflecting, protective hard case and operates on hybrid power (solar and battery). Features a durable gloss black finish with white accents, acrylic display protection to prevent cracksand a 3D light reflecting cover.